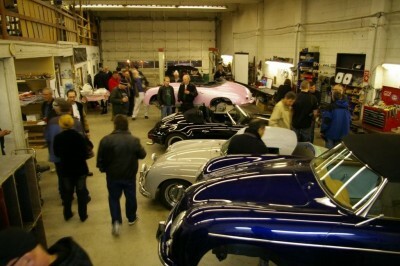 The Club held its February General Membership Meeting at Intermeccanica Custom Coach Builders in Vancouver ( www.intermeccanica.com ). Paula Reisner gave a fascinating presentation on the history of the company that she built with her husband, Frank, who passed away in 2001. Intermeccanica was founded in Turin in 1959 and eventually moved to Vancouver in 1981. The company’s first projects included speed equipment and one of the first rear-engined Formula Juniors. Over the years, they have produced a wide variety of specialty vehicles; many of which, such as the Apollo and the Indra were immediately recognized by Club members. In recent years, production has been focussed on their Speedster replica, in its many forms. The entire company story is well told on the company website. Henry Reisner, the president of Intermeccanica, then walked us through the entire process of building their very impressive, high performance cars. A big thank you to Intermeccanica from the VRCBC! And if you want to see another story of the tour with some really excellent photos, check out our friend Carl Jarrett’s blog on the SpeedHunter site here. Very rare Intermeccanica Italia under restoration - "I wonder if I can get this past Security?" Will those links fit a Healey.... or maybe an Anglia? Henry Reisner gets some Club swag, along with a very big Thank You!